Mondays are rarely singled out as good days. I mean, how can they be better than Saturday, right? But, good days come in all shapes and sizes. And, this Monday was good. Time in my day – and some jingle in my pocket – to sit down at Miso Sweet for lunch. Good! Ramen. And, Donuts. Charlottesville. Very Good! I know that not everyone has the time to sit down for lunch or the money to have a nutritious meal. It is not lost on me. Photo: My trusty four-year old Droid. Permanent thumbprint on the lens. Not a good photo, but then, sometimes, even on good days, you are caught camera-less and only have one thumbprinty photo to show for yourself. After lunch, I still have time to get to my Yoga studio for my own practice before my classes start. Awesome Good! Yoga classes are full. Bountiful Goodness! But, still. Delicious lunch. 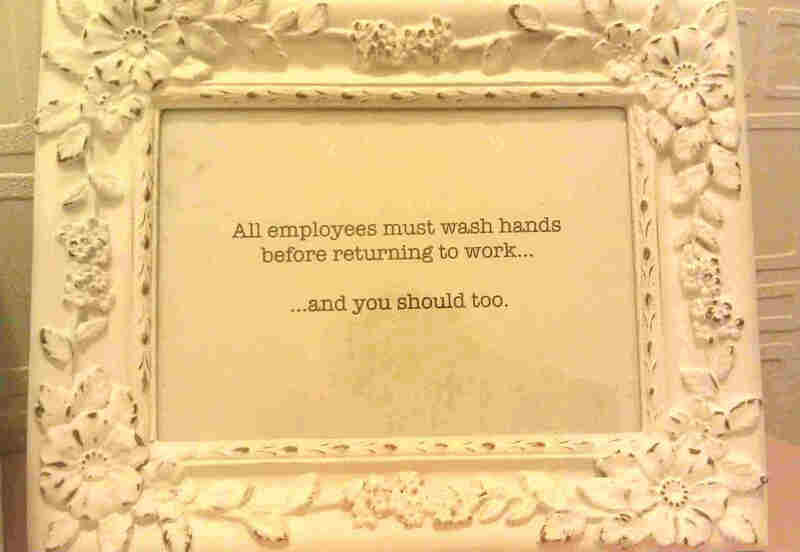 Good advice from a restaurant bathroom. Yoga. This entry was posted in Life, Yoga and tagged Good Advices, photography, Weekly Photo Challenge by Jackie, The Baseball Bloggess. Bookmark the permalink. Tell me that wasn’t one of your cats closing the door! Nope … not my cat. Although Polly can open and close the bathroom door (and can open the sliding closet door), I just haven’t captured it on video. She’s pretty remarkable, that Polly. :) OK – I love all of your posts but this is so, so hilarious I am laughing out loud. Given the way our O’s are playing – I really needed a laugh so thank you for that :)! I read about baseball a lot (too much). Baseball Blogess is my favorite AL East point of view, for a number of reasons. Not the least of which is your gratitude for a cup of noodle soup. That is very becoming, Jackie. As for the O’s trouble. Well you could have fooled me. That’s not the way that the A’s saw it when they were back there. I promise you … it was delicious ramen. (And, the miso-buttercream donut which I brought home for my husband, but then slivered off a piece for myself, was mighty tasty, too). Yeh, I loved those O’s who swept the A’s. They were a wonderful bunch of guys. I’m not sure where they went off to, because I haven’t seen them since Oakland left town. If you see them anywhere out where you are, can you let me know? Because they need to come home and get us back into the Wild Card race. The kids in the hip environs of SF, Berkeley and Oakland line up out the door for the noodles. I’ve never tried it.